Blond hair. A big nose. These aren't just the white people stereotypes Japanese people have today. 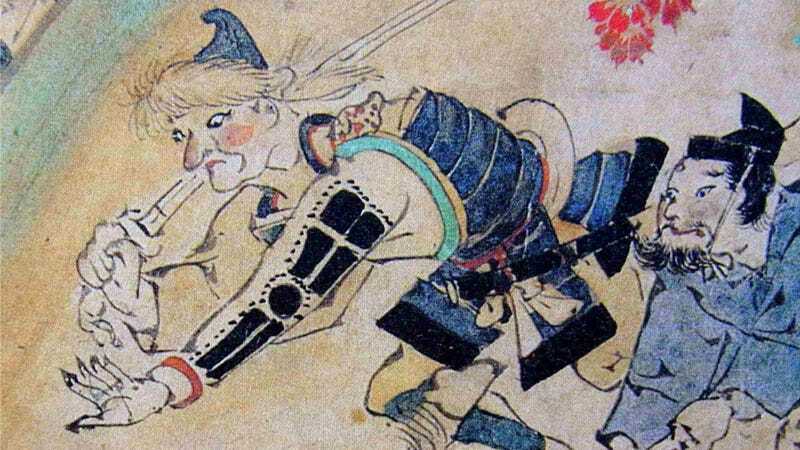 They also could describe one unusual individual in a 13th century Japanese scroll. According to the Tokyo National Museum, the scroll dates from the Kamakura Era (1185–1333). This is known as Japan's medieval period and saw the rise of the samurai class and the establishment of feudalism. It was also during this period that the Monguls, along with the Koreans and the Chinese, unsuccessfully tried to invade Japan. A while back, website Tokyo Metanoia pointed out this apparent white dude (above). The painting depicts samurai and bandits. Once again, it has recently become a topic of discussion online in a Japanese bulletin thread titled "I Cracked Up Because There's a White Person Among These Old-Timey Japanese Bandits." This image does inspire discussion. It really wasn't until after Portuguese landed in Japan during the 16th century that you really start to see white folks (and black folks) appear in Japanese art. Of course, you see more images of Europeans when the Dutch began trade relations with Japan in the 17th century. While you certainly images of foreigners (Chinese, Koreans, Indians) prior to the 13th century in Japanese art, I'm not sure if there are images of Europeans before that. If so, let me know in the comments down below! On 2ch, there is a range of theories about this mysterious man (these are internet theories, so your mileage may vary). Perhaps, wrote one 2ch commenter, these bandits came from Europe to Japan via the Silk Road. Or maybe this was a Russian. Others thought this was a legend—maybe a yokai (monster). One net user joked, "What is this, The Last Samurai?" Some thought that this wasn't a white person, but rather, a Japanese person in a fur hat. The result is simply people thinking the bandit was European because of the cap, confusing the headwear's fur with blond human hair. Makes sense to me. But that doesn't necessary explain the nose—but maybe it doesn't have to. Maybe this is just a Japanese person with a big nose. Maybe!